Shopping directly at Taobao.com is an intriguing experience. While more faint-hearted shoppers may never leave the comfort of a taobao agent’s website, adventurous e-consumers will jump at the chance to shop direct. Direct shopping will save you money. You’ll avoid agent’s fees of up to 10% and you’ll save the domestic Chinese postage for shipment between a seller’s warehouse and your agent’s place. But extra bucks in your pocket isn’t even the best part: a healthy feeling of accomplishment will grow as you maneuver the Chinese e-commerce system. 1.1 Can I buy from Taobao/Tmall internationally without agent? This method is far preferable to individual-word translating because you get the big picture. Sure, some of the text may look weird or seem poorly translated, but it’s sufficient to allow you to shop. 2) Open Google Chrome’s settings and search for “translate”. 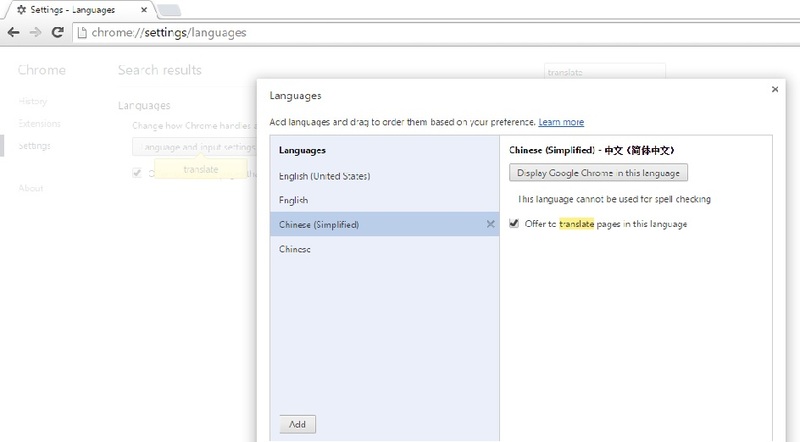 Make sure on the Language Input settings that Chinese (Simplified) is checked for “Offer to translate pages in this language”. If you get stuck at a non-translatable section, a good source for instant translation from Chinese -> English ishttp://www.mdbg.net/chindict/chindict.php?page=translate. Just cut and paste the characters into the box. If you cannot copy & paste to translate, you can install the google translate app on your phone,use your camera to translate text instantly. or try screenshotting text that was not translated and use http://www.i2ocr.com to translate the actual image. Open an account on taobao is very easy because it provides English version of sign up now.I have written another post on how to register a taobao account.just follow the steps you will be able to get your taobao account. It is advised to to download aliwangwang to communicate directly with the seller and forwarder.here is the download page. you can use product image and English keywords to search on taobao.here is the guide. Browse and shop in the translated Taobao.com site to your heart’s content.Click on a category or an item, and you’ll see a page lay-out similar to this one. Look familiar? Clicking “Buy Now” will take you directly to checkout. If you’re filling a shopping cart, you will need to add a check (√) by your confirmed item(s) to activate the orange “Submit” field. Before you fall irreversibly in love with an item, check the seller’s rating,you can learn more about seller rating and buyer feedback from this post. Estimated shipping costs from the seller to your address can be viewed on this page by “Freight’ (the Chinese yuan (¥) is worth about $0.16, or ¥6 to one US$). that means Taobao cargo can not ship this item to you.you need to find a taobao agent or your own forwarder. Contact the seller,copy the error info to them,ask the seller to give you a new item link with no brand name or minimal product info. Find a taobao agent to buy it for you. A weak point in the Taobao.com purchase path is the Chinese-language-only, non Google-translatable screen to enter Shipping/Delivery Information. The option “所在地区 ” has two dropdown menus.the first is Region list,the second one is country list.If you are from Malaysia,you can choose “马来西亚” from the first menu,then your city from second menu.others should 海外其他 from the first dropdown,then choose your country. For example, you are from USA,Reference the image above to choose the characters for the region “Overseas(海外其他)” and the country “USA(美国)” from the drop downs. The option “手机号码 ” is your mobile phone number,and “电话号码” is your landline number.If you don’t have landline number,you can input a fake one,it is not important.Make sure you input the real and correct mobile phone number. Taobao Cargo: Taobao Cargo,also called Taobao Global Consolidation and Shipping, is Taobao’s official forwarding service.the process is very simple.you need to make two payments just as using the taobao agent. if you choose Taobao Cargo while check out in taobao,Forwarder warehouse address will be shown as the receiver address,seller will automatically send your order to that address,You don’t need to let the seller know warehouse address privately. Taobao Cargo currently only support USA,Canada, Australia,New Zealand,Singapore and Malaysia,Japan.if you are not from these countries,you won’t see this option. Contact Seller Shipping: Seller Supported Countries,you need to contact the seller personally before select this option.Most of taobao sellers do not ship internationally or the shipping fee can be extremely high,so I do not recommend this option. NOTE: you should remember the name of the forwarder,once your parcel has problem or you want to track your order,you can contact them on live chat and aliwangwang. Items the carrier do not ship internationally:Battery,Liquid,Electric products,Powder,Lighter,Magnet,Tea,Food. High risk items: replicas and counterfeit items,it will bring high risk to pass customs if your parcel contains fake items or anything that infringe an intellectual property right. Zhongshan courier can ship the high risk items. JCEX Jiacheng is stricter,if they found your package includes high risk items,they will hold them in their warehouse,you should either pay to return the items or pay to get them shipped with a higher shipping rate. find somebody to pay(找人代付) means you can ask someone with an Alipay account to pay for your item(s). anonymous purchase(匿名购买):check this if you do not want people to look up what you purchase, when, from whom, etc. 海外段运费:means international shipping fee.it will be caculated when reaching the warehouse. Note: even if an item shows to be in stock and a payment could be made, this doesn’t mean that the seller actually has the stock. Thus, it is recommended that, after payment, you send the purchase order number and warehouse address to the seller to verify if they could send out the goods on time. On the next screen you will be on the Alipay account platform. 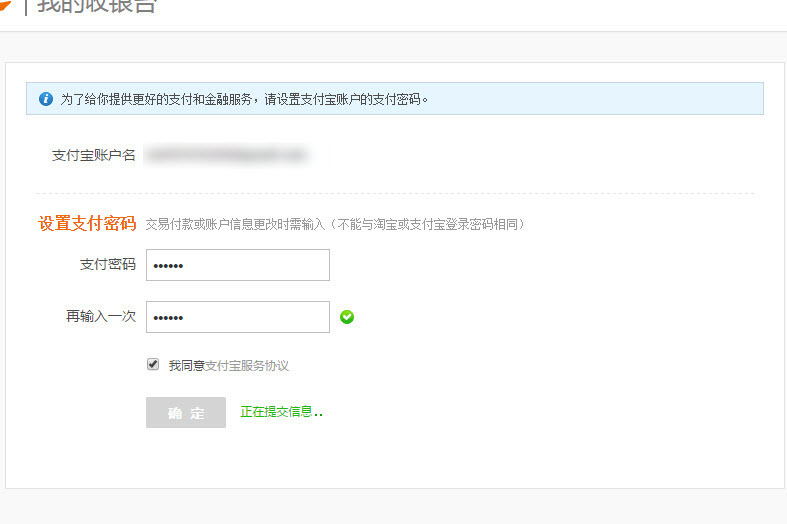 There you’ll see your own User Name assigned to an Alipay account. If it is your first purchase using Alipay,you will be required to create an Alipay payment password (6 numerical digits, non-repeating). This password is a unique one, and will NOT be the same as your Taobao.com password. 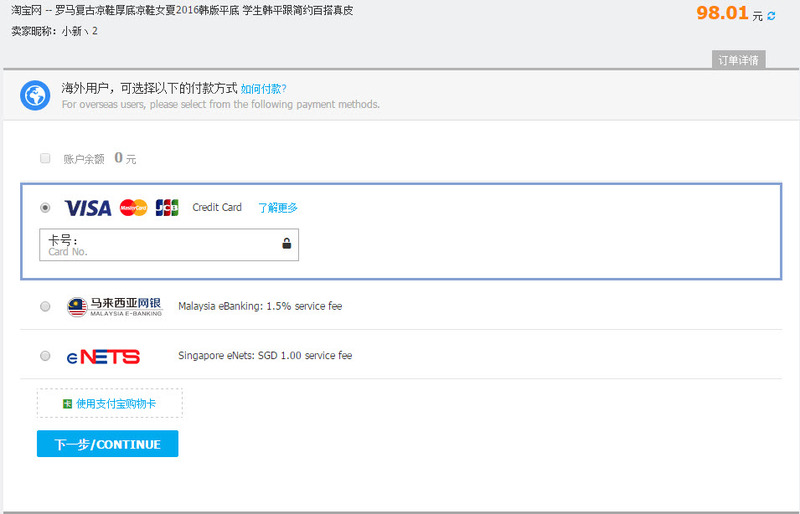 After making the first payment, you may go to “Purchased Items(已购买的宝贝)” to check the order info. Label 1.you can click this blue icon to chat with the seller. Label 2.退款/退货 this is where to request return and refund. Label 3.退运保险 if seller has bought domestic shipping insurance for you,you will be would be compensated when you return items from warehouse to the seller. Label 4. this filed displays the delivery status for demestic shipping period,I will talk more about this label later. Label 7.countdown timer, when this countdown timer expired,your payment will be released to the seller.It is not the time left to pay the freight forwarding fees. Label 8.确认收货(confirm recepit).you don’t have to click this to pay for international shipping.this confirmation is telling seller you have received the item,when that countdown timer expired,it will auto confirm.Just ignore this filed. —- 买家已付款 means you have successfully made the payment. —- 卖家已发货 means seller has sent your items to the warehouse. If the item you want is out of stock or does not have your preferred size, color, etc. the seller will send a notification to you via aliwangwang. So, if you found out that your item was not in the warehouse where it was supposed to be, you should check your aliwangwang immediately for any notification. —- 物流派件中 means the domestic courier is delivering this shipment. —- when you see ” 快件已签收” and hopefully a red button “支付转运费” on the right like picture below,it means the warehouse get your items and you need to pay for the international shipping fee to get your items. 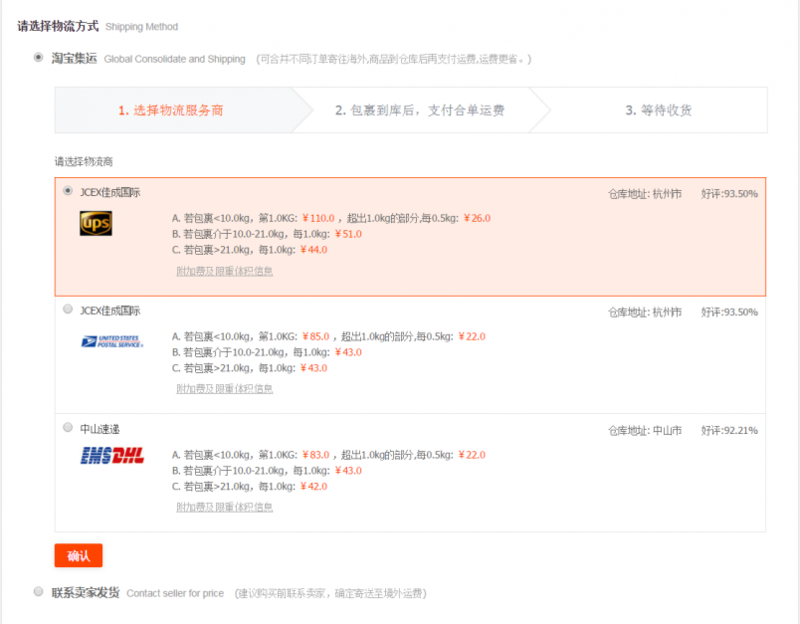 When all your orders reach the warehouse,Click the “Pay for international shipping(支付转运费)” button,you will then be able to select the orders that you want to consolidate and pay the international shipping for them.Click here to see the step-by-step guide on how to do this. The free storage time in the warehouse is 20 days,so you can consolidate all orders from different sellers within that period. you will be charged 1 CNY per parcel per day for extra days. You can only consolidate up to 20 parcels/orders,if you have more than 20 orders,you’d need to consolidate your orders into 2 packages as each package can only have 20 orders. There is a weight and size limit by the forwarder,Make sure your package does not exceed the limit. —- when you see “快件已签收” but no “Pay for international shipping(支付转运费)” button or only button like”处理转运”,this is not good because there might be something wrong with your items. Here, I would like to remind you that in average,your purchased items should reach the warehouse in 3-5 days from the date when order status changed to “卖家已发货” (which means that your items are shipped by sellers). If the “Pay for international shipping(支付转运费)” button does not appear after 5 days, it simply means there’s something wrong with the items. You should then check it with your forwarder and the seller immediately for clarification. This is very important. I have received emails from many readers saying that they have waited for days for the button to appear. Little did they know that there was something wrong with their items. And They won’t send you emails or SMS when items reach the warehouse,so You are advised to download “Taobao Global App” from App Store or Google Play. The “Logistics Helper(国际物流助手)” in the app will automatically send you the notification. if you want to know where the warehouse address is just in case,click Label 5 after your payment,find “收货地址”,that address is the warehouse address.”转运至” means your address(see screenshot below). 7.1 How long does it take to receive my Taobao order? Japan: 4PX 5 business days,PRouter 4-8 business days. 7.2 How can I track my orders? Note: for some countries,Waybill number for international shipping can only be trackable after your country’s Customs clearance.you will find no tracking information before that. for example,if you use EMS or DHL,you should go to the following site to track the shipment. You can provide your waybill number and ask them where your items are now(我的货现在在哪里),they will tell you the shipping status. The forwarder will modify your package to pass through Customs, they’re very smart at this so you shouldn’t have a problem.for example,Zhongshan courier will declare a lower price on the package or use EMS to avoid getting taxed with customs when shipping parcels to Canada. If you are worried about this,you can get the forwarder to declare a lower value or marked as a gift etc by aliwangwang the forwarder right after your payment for international shipping. From many buyers’ personal experience,EMS is the best shipping method when you want easiest clearance through customs since most of their parcels don’t have to go through the hassle of opening and inspecting. If you are using UPS or DHL then they will email you invoice of custom and collect money at your doorstep at the time of delivery. If you choose EMS then once your courier reaches your local post office,you will receive a call from post office and you will need to go there and pay. After the seller has sent out the goods, you may request for a refund within 25 days. Within the first 10 days, you may request for a refund by clicking the “Refund” button. Within the subsequent 15 days, you may request for a refund via “After-sales application”. If there is a refund,Money will return to your credit card within 7 business days.Service fee will return to you if the refund is initiated within 30 calendar days from the time you make payment. After 30 days, no return for service fee. You can return the goods from the warehouse to the sellers,but the return shipping address is needed,you have to contact the seller to ask for it.here is the step by step guide. How can I change my taobao account information (email, phone number)? How to contact taobao customer service or the forwarder? How do I verify my Alipay account? How can I return the goods from warehouse to the seller? Trust me, once you get the hang of buying directly from Taobao, It will always be your No.1 source when buy inexpensive and amazing stuff online. I can’t even remember what Consignee name i have put. How come Taobao always ask questions. We have already gave all our info when we open our account. They can check. So long as we pay for the goods, is enough. Not unless a Sales and Purchase Agreement is required, Taobao should not asked so many question to burden us. Our eyes are weak, and our computer keyboard is lousy. It is hard for us to give you what you want except money to buy items. Buying directly from Chinese taobao is not for everyone because of the language barrier.you should buy through a taobao agent or buy from some English websites like aliexpress,dhgate etc. I bought 2 cast iron woks through agent. Its second payment is almost 3 times its price. I regret clicking that “submit (don’t know what) button”. I am not sure if that buying transaction was through. Agent and I have been going through them on the email. Trying to say what we want to say is hard. Its complicating. When agent want to punish and penalized me, I get more headaches. I felt like a slave instead a buyer. I felt that they are swindling my money. The punishment and penalization are fee incurred for returning good back to seller from warehouse and agent administration fee. I though that in Taobao, one can return goods. But this goods are not send to me yet. How come I can’t return them? Also, I am a first time buyer. Chances for me to make mistake is high. Besides above, I did buy a lot of other item. All of them are paid. But i will not pay the 2nd payment, for i no longer want to buy any more thing from taobao, after the above bad experience. My question now is, will what ever i have paid, be cancel and refund to me, eventually?? NO,you need to return your items to get the refund.you need to contact the seller asking for the return address.submmit the refund application. i could not agree to the high shipment fee. thus agent did not sent goods to me. As transaction can’t be through, it should be cancel, but agent want to punish and penalized me for hidden cost like administrative fee and unforeseeable shipping fee back to the seller. you say I need to return my item but items is not sent to me yet. How am I to return it? Also, i don’t know where i can get and contact seller. Items is bought through agent. I have informed agent about it but she wants to charge me hidden cost like shipping and admin fee. If agent is to charge me this and that, then there will be no refund left for me. Hidden cost is forcing me not to return the items. So how now? To buy is impossible, to return also is impossible. which agent were you using? I purchased an item, it is now sitting in the taobao warehouse due to being “abnormal”, I am having trouble solving the problem or even finding the return shipping address. Can someone help out please? 1. use their special delivery service with a higher shipping rate. 2.request a refund by returning the item,they will rerturn items back to the seller. anyway,you should contact their customer service,they will solve your problem. Thanks for getting this done, it’s very informative. Just a follow up question to point 1, as I also have an item that is labelled as ‘adnormal’. How do I select this special delivery service pls? you need to contact your forwarder through aliwangwang,they will give you a link to use that service. Woah! your reply is super fast! Thanks. So this is possible even if i opted for direct delivery? if you mean “Taobao Global Direct Shipping”,then NO. Ok, what do you advise I do? Request for a refund? yes,you can request a refund,but I don’t know what you bought and which forwarder you use,you should contact your forwarder,they can give you a better solution. I purchase some items and it was paid successfully, I try to purchase something else and it gave me that message. I’m worried I won’t be able to pay my freight charge later. 1.The seller has closed this transaction. 2.Delay of the Alipay and banking systems,they have already deducted the money from your bank account,but you are trying to pay again. you should check your bank account balance. 3.you have exceeded the transaction limit or daily limit. you can contact the taobao English customer service if your problems are not solved. Does this mean I have to buy the services of the companies ? Are they the ones that you make the second payment to? Taobao Cargo isn’t available here in the Philippines, so I’m assuming that these companies are the ones I have to deal with. I’d like to know your input on this. HI,Enrico,they are all independent China forwarders,they can help you to ship items to Philippines.the process is a little bit different than the “Taobao Cargo”,so the most important thing is you should choose one that can speak English.they can explain the process and provide English customer service when you have problems. I can’t find link “Purchased Items(已购买的宝贝)” in my Taobao Account. Where can I find it? it is on the left side of “my taobao account” page. 1.5% Malaysian Banking vs 3% Credit Card. Seems like banking is the obviously cheaper choice? Or could there be an additional fee somewhere? I ‘m From Sri lanka. Can I buy items from taobao.com ? yes,you can,you need to find a reliable taobao agent. So, that means I’ll have to purchase from them? no,you still have to buy from taobao,you use forwarder’s China warehouse address.the forwarder will send the items to you when items reach their warehouse. There was a problem with your package. Click here to contact Forwarder. I have tried contacting the forwarder, but I still do not understand what the problem is as google translate doesn’t make sense. Now I am unable to log into aliwangwang as there is some issue with account security. I have contacted the seller and again google translate is not making much sense therefore I am unable to get the refund process going. I either want my money back somehow or get the item which is a watch shipped. The shipping company is JCEX Jiacheng. So far this has been a nightmare and it appears I won’t be able to get the watch from the forwarder. “您的包裹因特货原因无法正常入库” means your parcels contain branded items or sensitive items that can not use their normal delivery service.you have two options right now:first,you contact the seller asking the return address,and then let the warehouse send items back to the seller and you get a refund.second,you contact the JCEX,then they will ask you to pay for a higher postage to use their special delivery service.you pay for that postage,they ship the items to you. Anyway,you can get a refund or your item,drop me an email if you need any further help. Thank you! I was able to talk with JCEX and they were very helpful and I was able to pay a little extra for shipping. Your website is invaluable! Hi Brian – I am having the same issue as you, but I cannot figure out how to contact JCEX. Can you tell me how you were able to get in touch with them? Thank you so much! use aliwangwang to contact them. yes,you can.you need to choose the same forwarder as your last order.and you need to wait till all your items reach the warehouse.then you click the “支付转运费” to combine them together. no,you need to pay for the taxes yourself.JCEX won’t pay the duties for you. ok, how do i pay for the duties? for example, do i wait for the package or do i wait for a letter, contact my local post office etc? sorry for all the questions! i have never had this experience with customs before. i hear that some couriers have customs brokers that pay the fee to get the package out of customs, then charge you the fee later. i tried to read JCEX policies but did not understand well. JCEX has two couriers for international shipping,which courier were you using? UPS or EMS,you should contact the one you chose. JCEX give me a phone number which is the customs borkers:+1 (310) 665-9230 for clearance.you should try to contact them. Do they ship to Brunei Darussalam? No,you need to find a taobao agent. 2.you just need to provide the waybill number of your parcels,they will tell you which item has problem and what the problem is. Hi, how come whatever item i have selected, there was no direct shipping or consolidation and shipping (this option is grey and said the item is prohibited) and the only option is contact the seller. The item i selected was a diecast toy car and pillow case. Hi,1.where are you from? 2.try to buy from world.taobao.com not taobao.com 3.try to contact the seller,asking them to give you a new item link. no,the seller will not receive the money unless you release the money to them.wait for a few minutes,sometimes Alipay will fix the error automatically. Has anyone bought anything from Taobao and ship to VietNam? HI,Taobao doesn’t support direct buy from VietNam,you need to find a taobao agent. hi. Let say, i bought some items today, on day 1, and chose taobao cargo as my shipment method, and i already paid for the items. Which means my items are now being process. The question is, is it possible that both my items from day 1 and day 3 to meet at the warehouse, and ship together? I mean, will taobao know that i still have items on the way to the warehouse,(let say items on day 3 were being late) and wait for it till it reach to warehouse for consolidation with the item on day 1? P/s the items i bought all from diff. seller. *sorry if its quite hard to understand, but i need help here. Thanks in advance. in the simplest word, can the consolidation in the warehouse be done on items that being bought from diff. dates? The diff dates only like 3-4 days after first purchase made. yes,you can,the free holding time in the warehouse is 20 days.you have the option to consolidate any parcels you bought in between those days.should the free holding time expired,you need to pay RMB1 per parcel per day. So they will hold the shipment if they still see orders otw in my account? Thanks eric! yes,they will ship items to you only when you consolidate your parcels and pay for the international shipping. do you know how long the item from seller will reach to warehouse if i choose taobao cargo? Is there any specific days or is it usually depend on where the seller is origin? Hello, I recently bought quite a number of things from Taobao. I waited for all items to reach the warehouse before consolidating all items and ship it to my country. However, today I just realized that some of my items hv no option for me to consolidate it. Do u know why? I’m so worried that they might have returned it to the seller. Is there a limited time for storage? Many reasons can cause this issue,you should contact the forwarder to see why.Free holding time is 20 days.and you will be charged 1 RMB per parcel per extra day. Could you please advice who should I contact and what are the chances this will eventually get to me? Actually they can ship items with battery to you,you just need to use their special delivery service which means you need to pay for a higher shipping rate. I had a similar thing happen to me, where i purchased a keyboard with a built in battery, and when it arrived to the JCEX warehouse, it said “Sorry, your package contains a built-in battery by reasons beyond the normal storage, dashing contact with a good set of goods and suppliers”. Do i have way of shipping this to me? or will i just have to find another site which can ship it to Australia. You mentioned the ‘special delivery service’, how would i go about setting this up? contact JCEX through aliwangwang,showing them your waybill number.tell them you want to use their special service,they will give you the solution. Is there any agent that provide sea shipping? i need sea shipping for sensitive item and may order a lot item from taobao and 1688.
yes,agents like Peeka offer sea shipping for Singapore and Malaysia. I recently bought something taobao but when everything is in warehouse. when i want to pay for the shipping fees but when i check the shipping address the shipping address is wrong as its the old one. can i change the shipping address now? Hi Eric, I can’t seems to contact 4PX. Any solution? try to contact 4px at their work time. Hi is sea shipment also available from China to Malaysia if i’m using abx. Thanks. Taobao appointed forwarders do not offer sea shipment,they only have air shipment.if you use a agent or third-party forwarder,they might have this option.you can send your items to their China warehouse,they will then sea shipping items to you. Thanks Eric. If i’m using air shipment (4px – Airpack Express) from China to Malaysia and the weight is 4 kg, means I need to pay RMB 35 (1st KG) + RMB 84 (Next 0.5kg) for shipping cost? Thank you. Is the international shipping with UPS and USPS posted in US dollars or Chinese Yuan? I use debit card on Alipay without problems. You may need to contact your bank first because some banks may think it’s a fraud transaction. you should contact JCEX to check the delivery status. it cleared customs, but it has been 3 days since it was “transferred through transit point”. does this mean it is on its way (via ground transportation)? also, one more question: how long does it take to ship out the consolidated package from the warehouse to the US? it has been 3 days and status is still “waiting for library”…my other package shipped out immediately so i’m a little worried. thank you so much eric! Hi,Emi,they will ship out your package within 24 hours after you pay for the international shipping fee. My first time buying from Taobao and it has not been a good experience. 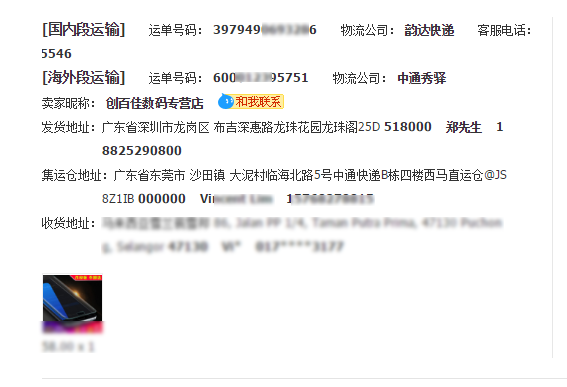 I purchase the item on the 23/04 and arrive at the warehouse on the 25/04 (according to Taobao website of my account) . The status has not changed since and sensing something wrong, I contacted the on-line customer service. The customer service on the other side mentioned item has not arrived at the warehouse…This is clearly not the case. With the airway bill no., the courier service web-site also indicated the package has indeed sent to Taobao warehouse. I’m now stuck where Taobao mentioned package didn’t arrive at the warehouse but courier service provide indicate the package is at Taobao warehouse. What can I do next? you can send screenshot of order details including order No, waybill number (chinese version) to my email address:[email protected],I will check it for you. Free holding time is 20 days.and you will be charged RMB 1 per parcel per extra day. Hi Eric, I have made payment for my parcel on 22 May which will be delivered to Spore and I’m using 4PX. It has been a few days but the current status of my parcel is still【海外】包裹抵达目的港机场，等待提货. What does this mean? Also, where do I find the button to delay the payment countdown timer (as I have yet to receive my parcel)? Thanks so much and I look forward to your reply! it means your parcel has already reached your country,you will receive it soon,and you can track this parcel by contacting 4px. 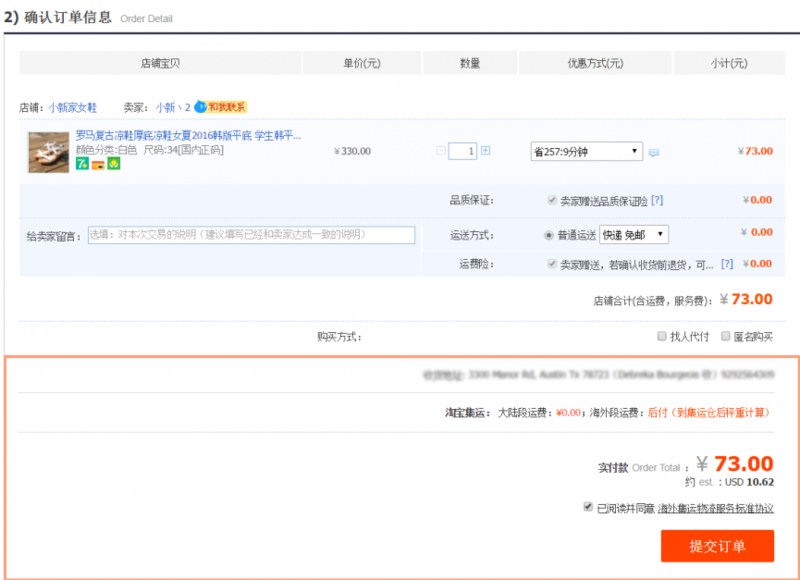 click “order details(订单详情)”,in this page,you will see “Delay time of receipt(延迟收货时间)”.that is the link to extend the expire time.